Discount Medspa Do-it-yourself-Botox website shut down. 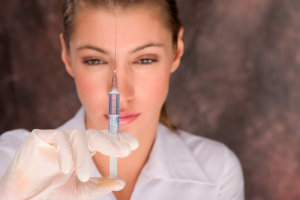 When we first discovered the videos promoting do-it-yourself Botox and filler injections being promoted on Youtube, I posted this article on Fake Botox or not, Discount Medspa is going to jail. Since then the websites have been shut down and the womant in the video's been charged with illegally offering prescription drugs without a license. Even before a December 2009 ABC 20/20 report on self-injectable facial drugs including Botox, Restylin and Dysport, the company Discount Medspa had been shut down for selling these types of products to consumers without prescriptions for them. Texas Attorney General Greg Abbott charged Laurie D’Alleva of Tarrant County, TX of illegally offering prescription drugs without a license on November 24, 2009 and gained a temporary restraining order barring her company from continuing to sell the drugs online. She is also charged with fraudulently claiming membership in Texas Medical Council, which doesn't even exist, and using this claim as a basis to say she can legitimately sell these products online. The real surprise is not that this was shut down, it was the number of coments (98) from individuals proporting to be Discount Medspa patients who were defending the site and Ms D'Alleva. Shocking in some cases. Here are some of the comments. "If smoking dope is okay with the moron than leave our botox self injection alone, no one is having a problem with it except the money grubbing doctors and pharmacys that sell the stuff. Bug off!" "Funny we can inject ourselves with insulin and yet because of the greed of physicians, someone like Laurie is put out of business because why? She put the choices into the hands of the people." "The FDA does not regulate how doctors use it. They go through a 3 hours class to inject it. What is the best way to learn? (DO IT YOURSELF)"
"I did purchase from Discount MedSpa and injected myself with Freeze (crows feet and forehead). I am extremely happy with the results. I will definatley do it again. I also have a college education and run my own business, so don't call me stupid." "I have used the Freeze product from Discount Medspa with great results. The over priced Doc I received injections from did not do any better job than I did myself. It took 10 minutes and study on facial muscles. If the product is pure I see no problem with being able to inject at home." "If I want to Freeze my face then let me and stay out of my business. It's not like I am harming anyone else. It's not like I am unfamiliar of the risks. It's not like I am jumping off a bridge and acting irritational, it's Cosmetic!" "all these other money hungry Doctors thinks $320 every 4 to 6 months is reasonable thats crazy!!! I was purchasing 100 units of Freeze for $149.00 and was doing it myself do you think I am going to spend $320.00 for 40 units and have someone else do it,"
"Once I did the injections I realized how much of the "you will hurt yourself" is hype. This is the mantra that will brainwash us into being dependent and financially strapped to our medical treatments,"
"Yes, it is crazy...I have done it myself, I had great results with the fillers but always wondered what was really in them, what was I injecting into my face?"